Dried red chilli - 3-4 nos. · Peel the skin off mango, cut into small cubes and marinate with salt and keep it for 5-10 minutes. · Take a pan and heat it high flame and put 2-3 nos dried red chilli into this pan and switch off flame, sauté red till start to become little black in color,Dont allow to burn. · Grind grated cconut,heated red chilli ,2-3 nos. curry leaves until smooth paste and finally add 1/2 tsp mustard seed and grind for another 2-3 seconds. 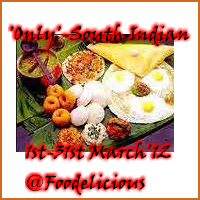 · Add coconut paste to marinated mango. Finally seasoning with mustard seed, curry leaves, dried red chilli. 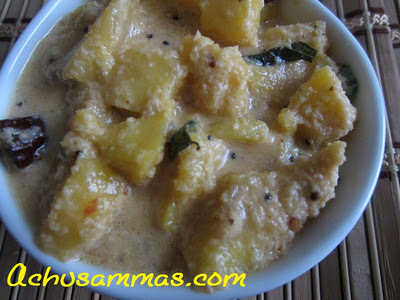 Yum pachadi..one of my favorites..
looks very delicious..never tried adding ripe mango with coconut..
Wow. This is all new to me. Mango and coconut must go together ever so well. Bookmarking this! Yummy yum delicious pachadi..Looks lovely!! This I am going to try, I have a box of mangoes, all ripe at the same time..
Lovely clicks , Very well presented! Very interesting dish. Mustard seed seems so unusual with these ingredients. I'll have to try this now just to see how it tastes. Thanks for sharing. 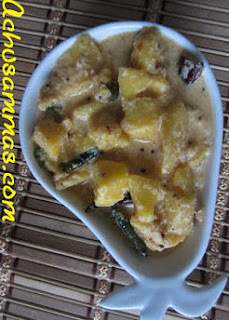 manga pachadi post cheythe kothippikkuva alle....superb dish..
Pachadi looks yummy .. my mom makes it for festivals. This is new to me...but I'm a big mango fan, so this sounds good!